Paolo Scoppola is a multidisciplinary artist, with a degree in Computer Science, musician and photographer. He began his professional career in 1998 by developing applications of virtual reality in the field of cultural heritage (Infobyte) and then in 2005 he moved to the television and film sector (Centro Sperimentale di Cinematografia, Direct2Brain, Clonwerk and Lobel Graphics). In the same period he realizes TV credits (RAI and La7), music for documentaries and photographic reports. In 2008 he presented at the Spoleto Festival :: Reflection, the first of a long series of interactive video installations. In 2011 it was the turn of Air Drops at the Teatro Miela, a work of interactive painting that ends at FuoriSalone 2013. In the same year, in Trieste, he develops a series of interactive projects for the Museum of Sciences and for the BRAIN center, where he experiments interaction with brain waves. In 2012 he collaborated with the National Institute of Nuclear Physics for the realization of Il Dono della Massa, exhibited in various international contexts including the Art Science Musuem of Singapore. 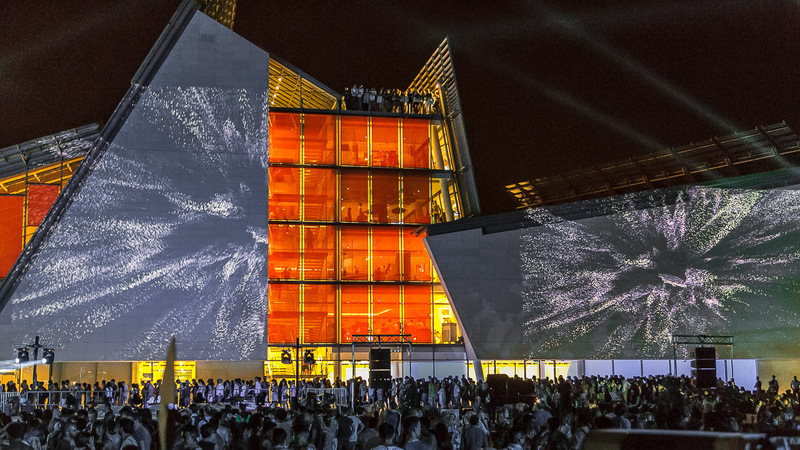 In 2013 he made Sonora, a musical video performance for the inauguration of the Trento Science Museum. In 2014 he made the permanent Chromatic installation for the Lines brand. In 2015 he took part in the international project “On the traces of the glaciers” exhibiting at King Abdullah University and at the Pigorini Museum in Rome. In 2016 he created Meteomorphosis for Goretex, exhibited at the Fuorisalone of the same year and awarded with the Outdoor Industry Awards. In 2017 he took part in the project “Cracking Danilo Rea” with a video performance that saw him perform alongside pianist Danilo Rea. Finally, in 2018 he created “Centogrammi” a three-dimensional video installation for the Ministry of the Environment and created, in collaboration with the choreographer Sarah Taylor, the interactive dance performance “La memoria restituita”. © Paolo Scoppola – All rights reserved. All files, photos, music and texts contained in this site are owned by the author, and they may not be reproduced, stored in a retrieval system or transmitted, in any form or by any means, without his prior written consent – website design by the author.